Maddening! I’m away from home at a conference with limited time for writing and all of a sudden there’s TONS to write about. Maddening! First, a little equine history. 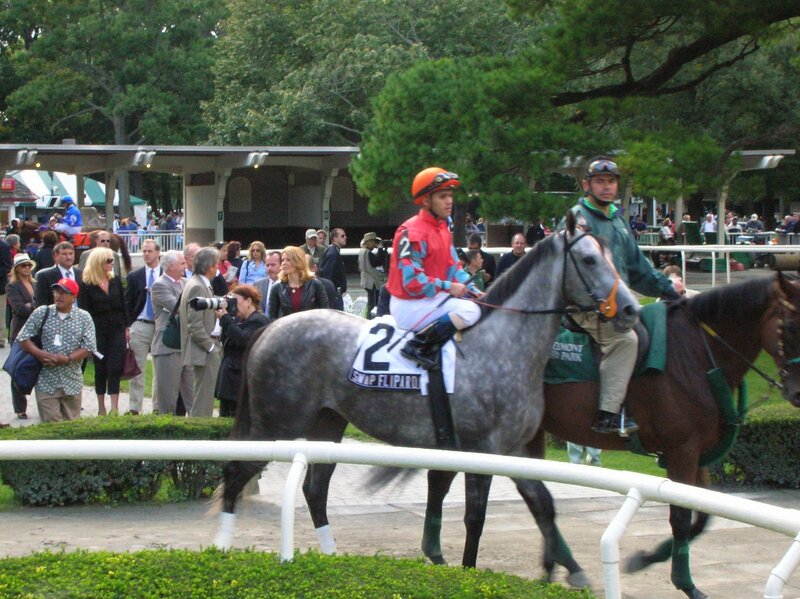 Friday afternoon at Belmont is the ungraded Storm Flag Flying…and what a pleasure it is write about this amazing mare. By Storm Cat out of My Flag, she boasts a delightfully creative and euphonious name; her dam is by Easy Goer out of the magnificent Personal Ensign. At two Storm Flag Flying won the Grade I Matron, Grade I Frizette, and Grade I Breeders’ Cup Juvenile Fillies; an injury hindered her three-year-old season, but she rebounded at four to place in the Breeders’ Cup Distaff and to win the Personal Ensign…yes, the race named for her grandmother. She had a foal by AP Indy in 2006. Friday’s race features two Grade I winners whose best racing days may be behind them: Pussycat Doll and Swap Fliparoo (pictured at Belmont last month). Pussycat Doll hasn’t won since last January at Santa Anita, and in five outings since then, her best finishes have been a second and a third, the latter in the Gallant Bloom at Belmont in September. Swap Fliparoo hasn’t won since February at Gulfstream; she’s raced eight times since then with no finishes better than third (she’s had four of them), and her running lines don’t offer much cause for optimism, unfortunately. She’s a sentimental favorite for me. Baby Bird is the morning line favorite; she won her last outing in an optional claimer at Belmont a month ago. In a very random bit of somewhat perplexing media news: I’m a big fan of the sports section of the New York Daily News, and of the journalists who cover racing and hockey for them. Sherry Ross, who covered both and who did a great job at Saratoga this year (both handicapping (she won the Battle of Saratoga for the third time in four years) and writing (she was a driving force behind the paper’s significant coverage of the Spa), has left the paper to do color commentary for the dreaded NJ Devils, but Jerry Bossert continues to cover racing, and Thursday, racing coverage was easier to find than hockey coverage. The online version of the sports section is absurdly difficult to navigate, but there on the second page (under More Sports”) was the racing report, while I had to dig to a third page to find the Rangers’ report.